Nose: The nose on this is unmistakeably Octomore – the malty, sweet, cured meats, and damp vegetation notes that are prominent on the nose of just about every x.1 Octomore release. This one also brings in some lighter fruity notes, as well as an undercurrent of sweet white wine. There’s also just a slight touch of the dying gasps of a wood-fired barbeque. Palate: Up front this whisky is a battle between the raw oak flavours and the peat – both the smoky burnt peat as well as a dark vegetation note. It’s quite a sweet peat – nothing like the medicinal iodine-rich peat that is normally associated with Islay. The oak comes through with both charred woody notes, as well as a fist full of that oak spiciness. There’s some burnt golden syrup hanging around, and also some slight traces of vanilla pods and brown sugar. Mouthfeel: This whisky is thick. Super thick even for an Octomore, which are generally quite thick whiskies. No joke – you could almost chew it it’s that thick. Extremely dry too. There’s a slight burn to this one. Finish: The finish on this whisky is ridiculously long. Lots of sweet peat and wet forest undergrowth, with the oak spices coming through with a vengeance, but dying quickly (the oak spices that is, not the finish). Once the oak leaves, there’s quite a bit of vanilla mixing with the peat and vegetation. The finish is possibly the best bit of this whisky – it’s mouth-watering. I was going to start with this being an unusual Octomore – which it most certainly is, but it’s not just that; this whisky is not even just an unusual Scotch, it’s a highly unusual whisky. That might be an odd way to introduce a whisky, but it is no less true. Octomore 7.4 is one-quarter made up of whisky that was solely matured in virgin French oak casks from the Allier region of France and aged for a period of seven years in the far corners of Bruichladdich’s Port Charlotte warehouse. The remainder spent three years in first-fill ex-Bourbon casks before spending two years in some more of those same virgin French oak casks, before spending another two years in new first-fill ex-Bourbon casks. The whole lot was then married together and bottled at 61.2% with no chill-filtration for a total of 12,000 bottles. 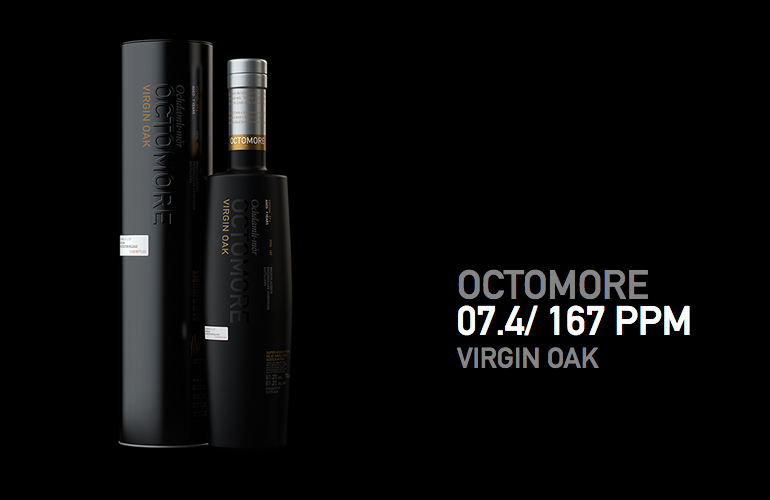 Octomore 7.4 has the lowest peating of the 7th series – having been peated to 167ppm. I can’t say that this is one of my favourite Octomore releases, in fact to be honest it’s one of my least favourite of the ones that I have tried so far. I’m not a big fan of too much oak flavours and spices in my whisky though, so this was probably never going to have been high on my list – being a “Virgin Oak” release. Not being one of my favourite Octomore releases though does not make this a bad whisky – it is definitely one that I would happily have a glass of, and the bottle I have of it will not have any issues getting polished off. Putting the heavy oak influence aside, this whisky has some seriously impressive features – with the finish going on, and on, and on, and on for a seriously long time; and the mouthfeel being one of the thickest, chewiest whiskies that I have every had – and that is quite a feat given that most Octomore releases, and in fact most Bruichladdich bottlings across all their ranges, are quite thick whiskies. This one does have a slight burn to it though – something that might not be unusual in many whiskies with an ABV of 61.2%, but it is unusual for an Octomore; and they are all bottled at quite high percentages. Bruichladdich’s Octomore range started with a “what if” moment – with their then head distiller, Jim McEwen, wondering what a whisky would be like if you peated it as highly as possible, and bottled it without mixing in any non-peated malt. The Octomore 7.4 was another “what if” project, with current head distiller, Adam Hannett, contemplating what the result would be of pairing Octomore’s super heavily peated spirit with virgin oak casks. There has been a few European distilleries who have aged their spirit entirely in virgin European oak, even a few Scotch distilleries that have experimented with virgin casks from various sources, and every Bourbon is aged in virgin American white oak, but this was a first for a spirit with the peat levels that the Octomore spirit receives during its malting. Whilst not one of my favourite Octomore releases, this is definitely not a bad whisky – and is definitely a whisky that every Octomore fan, and every fan of peated whiskies, should sample even if just to experience the impact that the cask can make on the whisky – even a whisky with a spirit as powerful as Octomore.